I have no idea where this story starts– only Emily could tell you that, and she has been silent for years now. I can’t fill in all the details, but I can tell you when her shadow crossed over our doorstep. It was a fine and cozy doorstep in Ripon, North Yorkshire, England, and it was our home for four fantastic years. We dove headlong into the spirit of British life and tried to pretend that we were Brits ourselves. We fooled no one, but we had a good time. The kids attended British schools, my husband and I drove on the left side of the road (more often than not), and I learned how to make a mean steak and ale pie and sticky toffee pudding. When we returned to the States in the summer of 2009, there was a posh lilt to my children’s speech, a cupboard full of treacle and hedgerow jam in my kitchen, and a ghost in our walnut chest of drawers. These things happen when you live close to the Yorkshire Moors. The old Queen Anne walnut chest — did we buy more than we bargained for? The chest that housed our shadowy friend came from an auction house twenty minutes north of our home. 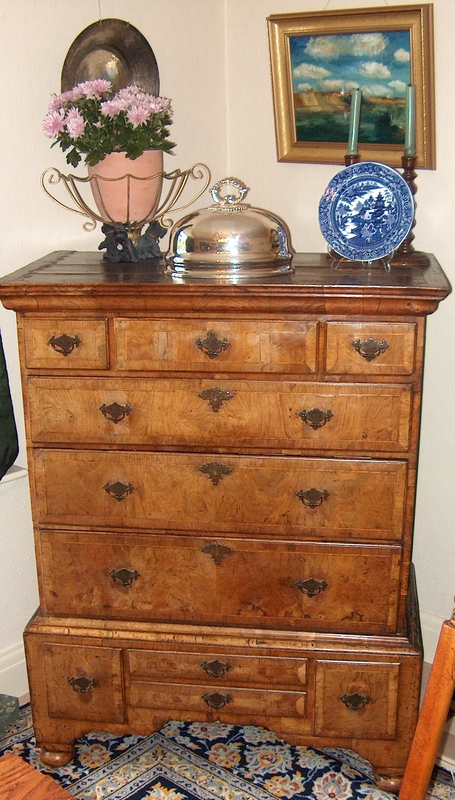 She is a beautiful old walnut piece–Queen Anne era, so roughly 300 years old– originally a chest on stand with longer, probably delicate, legs. But three centuries of life had, literally, brought her to her knees. Now she stands on stumps– ball feet that are likely over a hundred years old at this point. I think the chest is beautiful. . . the hard knocks of a long life have made her quirky, but she still sings to me. So I was overjoyed when we brought her home from the auction house and carried her into our dining room. We dusted her off, gently cleaned the insides of the drawers, and whooped and hollered when we found a secret compartment. It was cobwebby, and James shuddered as he stuck his hand in there. We both hoped there would be old coins or letters, some relics of the lives lived in times beyond our reach. But there were only cobwebs. While we moved furniture to settle the new piece into its spot in the dining room, my daughter (who was about 7 years old) was upstairs digging into her dress up box. She came down the stairs in a colonial era dress, saying that we must call her Emily. It was cute, and she kept up the charade, never breaking character, until it was finally time to march upstairs and take a bath. Meanwhile, after dusting our chest and admiring her beauty in a tidy corner of the dining room, we continued on with our life. Dinner had to be made; children had to be bathed; bedtime stories were read, and, eventually, we all tucked in for the night. Unsuspecting. In the wee hours, someone woke me up. My young children were standing at the edge of the bed. Without even fully opening my eyes–as this was an all too common pattern with my son, and it was a ritual I could very nearly perform while still asleep– I got up and cupped my arms around my two children to lead them back to bed. My left arm scooped my son, but my right arm came up empty. I opened my eyes and turned to find Kate, but she wasn’t there. “William, where’s your sister?” I asked. “She isn’t here,” he said. I shrugged it off, just happy to have only one child to put back to bed. But I woke up the next morning and sat bolt upright: two children, I thought, I saw two children. I saw two children–a boy and a girl. There were two, and then there was one. I asked my son again that morning where his sister had gone, but he told me that she was never there. I don’t spook easily. I’m not particularly superstitious. And, oddly, I was fairly pragmatic about this. I told my husband about the incident and put it out of my mind. Until I woke up in the middle of the night to find my husband standing up and running his hands all around the bed, looking for something. “What are you doing?” was my question, naturally. “One of the kids is in the bed,” he said. “No,” I said, “there’s no one in the bed but me.” But he wasn’t convinced. Something was in the bed; someone had come into the room. There was really only one explanation. Only one new member of the family in the past week. And apparently she was more ambulatory than those ball feet let on. Could a piece of furniture harbor a ghost? We decided to call this maybe-ghost Emily. I suppose she had tried to announce herself the minute she came into the house. We spent the next few days sipping a strange cocktail of emotions–a shot of intrigue, a splash of fear, a dash of dread, and a big old chaser of humor. Honestly, who buys a ghost with their furniture? And a ghost that tries to climb in bed with you at that? There is a whole lot of creepy to that–but, as much as I squeezed my eyes tight the next few nights and swore to open them for nothing until the morning came, my motherly instincts kept asking why? I mean, assuming there was a ghost and we weren’t just nuts whose imaginations had run away with them (not a sure bet, I know), why would a child keep just showing up in our room? Loneliness, I suppose. I wanted to know the story–this ghost was going to kill me with curiosity, if nothing else. So my husband and I drove back to the auction house and asked the owner, Rodney, if he could shed any light on the piece of furniture we’d bought. 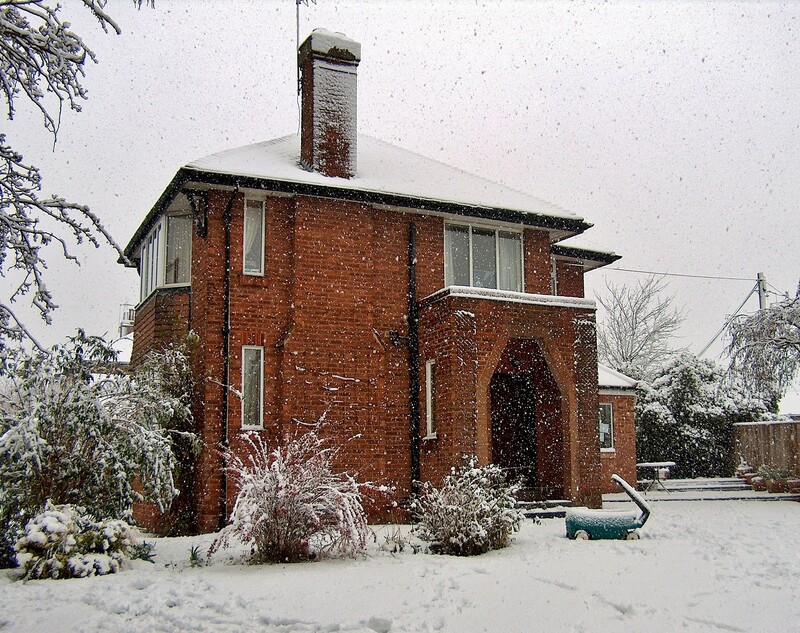 He disappeared in the back office and quickly reappeared with the only paperwork he had on that piece of furniture–paperwork indicating that the chest had been removed from The Old School House in Thoresway, Lincolnshire. This told us absolutely nothing about the circumstances of the chest, but it also did nothing to quell our interest. A School House? A building with a long history of children, children, and more children? Our heads were spinning. But what can you do? We didn’t have an answer at hand, we didn’t even have a problem on our hands, we just had a curiosity. A couple of incidents in a couple of weeks’ time. And plenty of friends to add in their two cents: antiques have bad feng shui, and did we know that young children used to sleep in dresser drawers (pulled out) before there were cribs? My favorite reaction came from the wife of the local cathedral’s canon: Oh how wonderful! I’ve always wanted to see a ghost! 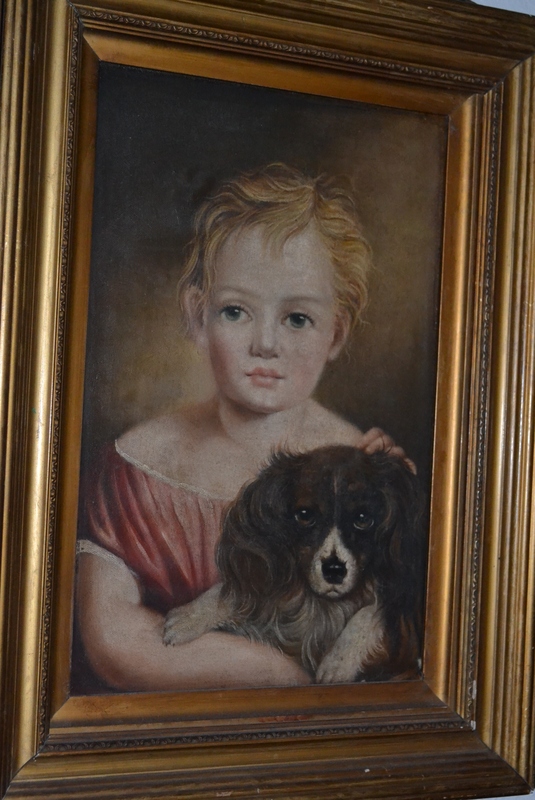 Within the next week or two, I purchased an old painting from an antique market: a portrait of a child with her dog. We named her Emily and hung her on the wall by the chest. If you can’t beat them, join them, right? I’m not sure how to tell you the next part of the story. To be honest, I usually tell it to friends around a table where the wine is flowing freely. Somehow that puts people in a better mindset to hear it . . . and also makes them more understanding of this next twist. I’m a softy, and I’m sometimes a kook, and when something lies heavy on my heart and I drink wine–you know. Emily didn’t show up much in the next year, but this is no surprise because she and I had a heart to heart late one night, and I think this put her at rest. James and I had been out to a friend’s party–homebodies that we are–and we’d had a very good time. I had an especially good time, and came home feeling very generous and earnest and just a bit wobbly. When we got home, I pulled a chair up to the chest and proceeded to tell Emily, at great length, that we just wanted her to be happy, and that we were terribly sorry if we acted terrified of her, but we’d be honored to have her in our home. Because that’s how everyone talks to their ghost-furniture, right? Well, you know, I meant it. And it worked. Peaceful nights from then on. And then we moved Emily over the ocean on a slow boat and resettled her in Georgia. We laughed a slightly nervous laugh and joked that she’d be really angry about that–brace for chaos. But no chaos came. We moved into a new house, re-floored, painted, and set Emily up in the formal living room. The house looked good; the chest looked good; the feng shui felt right. And then my husband threw a curve ball. He saw a wierd, shadowy something in the corner of the front hall–right by the living room. He didn’t know . . .he was just saying . . .it was strange and his first thought was Emily. But I didn’t believe a word of it. James likes to play pranks, and as much as he insisted, I laughed and said right, like I would believe that. End of conversation. Until a few weeks later, when I was scrolling through messages and pictures on my new flip phone (it was 2009). My daughter, then a 4th grader, had been having fun with the camera phone–catching her grandmother in her pj’s, photographing her brother with a cabbage on his head, taking a photo she entitled Haunted Hallway. . . . This stopped me cold. She had photographed the same spot in the house James had described and she gave it that caption. I very nonchalantly asked her about the photo. She said, “Oh, it just looked wierd, so I took it.” No more reason, no more thought. It was haunted seeming, so she took the picture. The photo didn’t look that strange to me, but then how photogenic are ghosts? And what a strange, strange coincidence. You can be a skeptic, and I won’t blame you. But me, I’m a big fan of Emily. At least for now. When we moved to Germany, we left her in a storage facility until we return next year. That could make for one mad ghost. Check back with me in a year, and see how she took it. Or, better yet, come over and drink wine with me next year–we’ll have a heart to heart with Emily and smooth things over. Great story – I think furniture always absorbs characters. The story lover in me would really like to believe that objects we touch or love always carry something of our energy, and Emily should make a believer of me. Spooky and creepy . . . and kinda cool too. Happy Holidays to the tune of “O Tannenbaum” ! My moto: anything is possible! And when it comes to Emily, I believe! What a wonderful story, I truly believe in Emily! I also have had encounters with ghosts in old houses and more. At first it freaked me out, but then I got used to it. I just read up on how there may be many more senses than the five we use. I am a firm believer in that too. That is why some people sense more than others! Totally cool! Thanks–we love new members on team Emily! I’m funny about the ghost thing– a major skeptic of most of the “boo”-style stories, but a real believer that anything can happen on a spiritual plane. Why not? Casper is definitely the way to go! It’s funny, I can be skeptical about lots of ghost stories: rattling chains and things that jump out and say “boo” just don’t do it for me. (What’s the point in spending eternity doing that?) But give me a lonely child or something poignant, and my heart sympathizes, I guess. Thanks for reading, and enjoy the holidays! Oh lovely! I’d be glad to come visit with you and Emily over a glass of wine. What a sweet and spooky true story from travelsandtomes.wordpress.com. How kind. Thanks for reading and sharing. And the merriest and happiest of holidays to you! How sad that Emily is in storage and not enjoying frolicking in Germany with you. I know. But transporting such an old piece back and forth across the ocean also seemed like a risky proposal. Let’s just hope Emily understood and doesn’t bear a grudge! For what it’s worth, we did bring the portrait with us, so we continue to pay homage to her. Merry Christmas to you and yours! The same to you and have a wondrous New Year! A great story well told – never say never! Thanks so much. “Never say never” and “anything is possible”– two mottoes we live by! Happy new year! A belated comment (I’m way behind with my blog reading). We had a haunted chair once. Not that the ghost ever did anything. It was just that anyone going into the room where the chair was always thought someone was sitting in it. When they turned to see who, the chair was empty. Three of us in the household experienced this individually. It wasn’t till someone said, “I think that chair’s haunted,” and we compared notes that we realised we all felt the same! We also agreed on whom we would have expected to see sitting there, had we got a proper look. A tall man with his legs stretched out in front of him, crossed at the ankles. We didn’t know anything about the chair’s history. It was a Morris chair (wooden arms, with a padded seat and an adjustable padded back) that a family friend had given us. The chair had a long and happy (I hope) life in our household(s), but eventually looked very shabby and not worth refurbishing. So, feeling guilty (it was the ghost’s chair), we sent it to the dump. Great story! That seems like too much coincidence to shrug off. I wonder what became of that ghost, or if anyone salvaged the chair and came home with more than they bargained for! Thanks for reading. Pingback: Daily Prompt: Ghost | Greetings from Niceville!